New for 2013, JC is offering their new Limited TriToon with a rich feature-set and price that cannot be beat! Boundary Waters Resort & Marina is consistently one of the top JC TriToon dealers in the country, with a large selection of new boats for sale in north georgia, as well as used boats on Lake Chatuge. 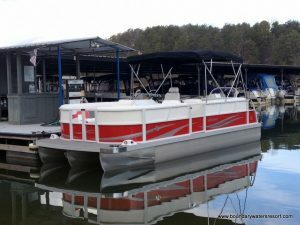 We also offer the largest fleet of boat rentals in the area, featuring new JC TriToons, so you can go for an extended test drive on Lake Chatuge. Call us today to see the largest inventory of boats for sale in North Georgia!